Cheap Website Design – Cheap Web Design – A Breeze if you know the right developer. 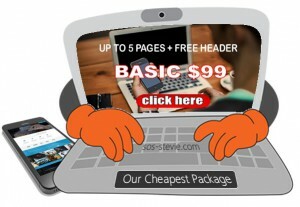 Cheap Web Design – A Breeze if you know the right developer. When it comes to Cheap Website Design, WordPress does the trick and it’s convenient. You might be tempted to not use a professional website developer for your next online presence. After all, doing if yourself is as cheaper as it can get and if others can do, why wouldn’t you? This is by far one of the most commonly used statement potential I hear from potential customers when they first call me, as if they were trying to get some sort of encouragement to go and do it alone. If your intent is to spend time learning about website development, and you have the time to do it, then I would say, you’re bound to hit a few bumps along the way, but as you progress, you will acquire enough knowledge to put something out that you you’d be proud of yourself. I have cheap website design packages built on the wordpress platform and with prices starting at $99, any cheaper and I would practically be doing my job for free. There is one thing about a “do it yourself” approach and that is that if your marketing campaign is effective enough and you are starting to get a decent amount of traffic coming to your site, then you might discover that the site might not be able to cope with the number of visitors that come to say hi, and, or you might need certain improvements that would definitely be outside of your comfort zone and expertise. If at that moment you’d consult a web developer, it is likely that the answer you will get is that you need a brand new design, and as you know that might be a rather proposition. For the above reason, making a choice between doing it yourself and choosing one of my cheap website design packages is pretty straightforward. You want to be successful with your site and the way to do it is by working with a professional. Whether you choose one of my cheapest packages, or need something more “a la carte”, what is included in all my designs is an array of tools and apps designed to make your site one that I myself would be proud of. Here is something else that’s include. More than 15 years of experience in web development. Copyright © 2019 Cheap Web Design – A Breeze if you know the right developer.. Powered by WordPress. Theme: Esteem by ThemeGrill.